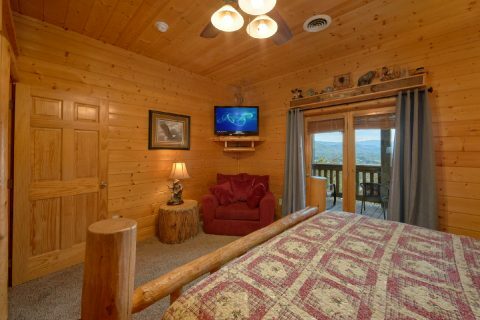 Stay in the heart of the Smoky Mountains only minutes from Pigeon Forge in "Lodge Mahal!" 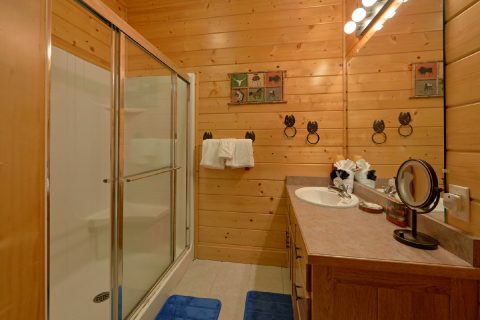 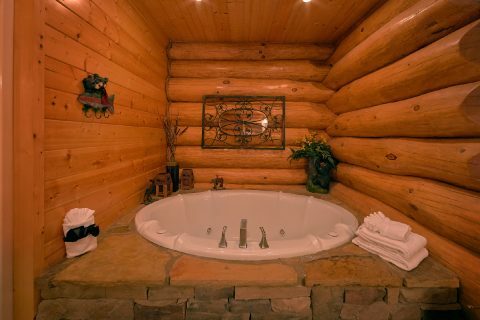 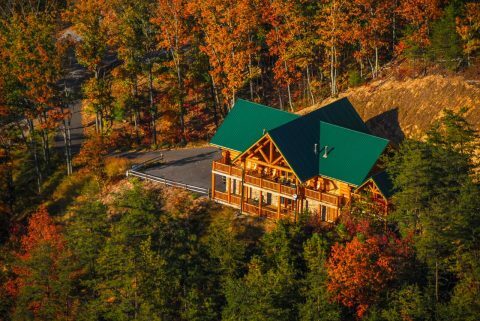 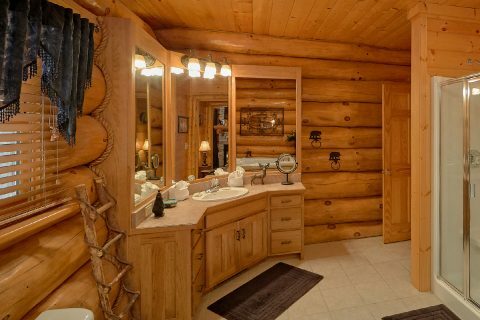 Built with massive, hand-scribed 14" to 24" timbers, this luxury 4-bedroom cabin lodge stands above the rest with stylish décor and top-notch amenities. 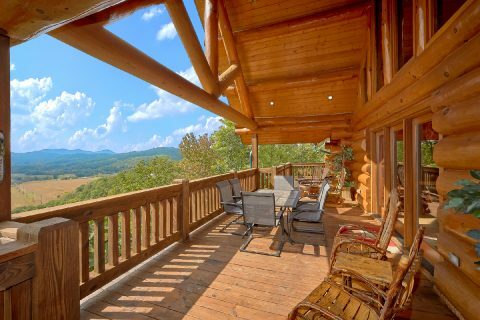 With room for 10 guests, you'll find true rest and relaxation in this Wears Valley cabin that boasts awesome mountain views. 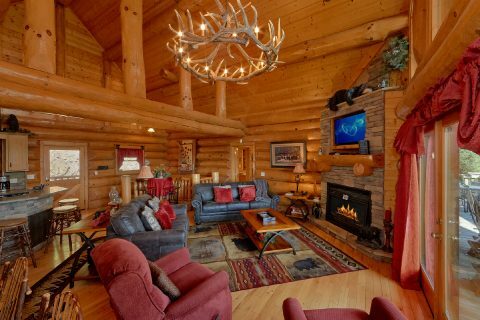 As soon as you enter the graciously sized living room, you'll be glad you chose a premium cabin for your stay. 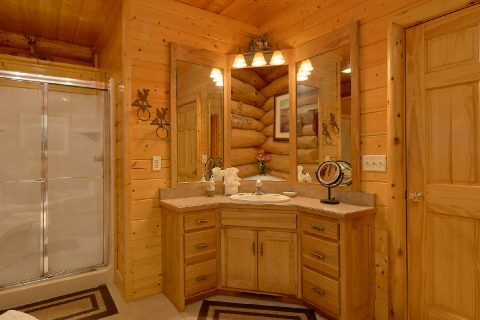 Every detail of this quality cabin is designed to boost your vacation experience. 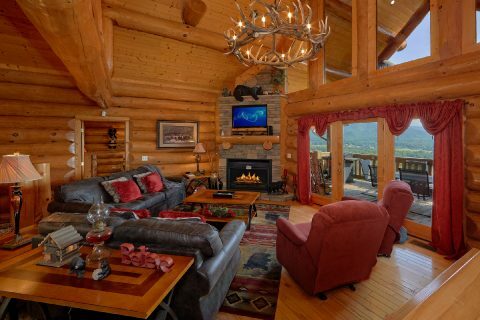 From the large picture windows to the elegant antler chandeliers, this lovely mountain lodge is luxurious down to the smallest detail. 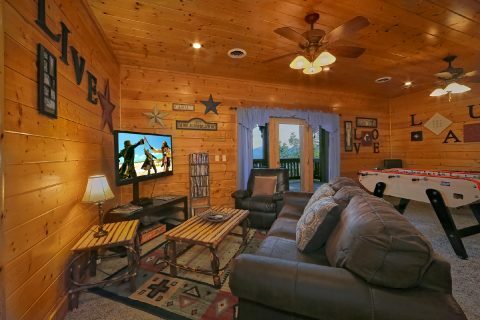 For watching your favorite shows and movies, the living area comes complete with a sectional sofa, a stacked-stone gas fireplace, 42" wide-screen TV, DVD player, and a satellite package that includes the NFL and other premium channels. 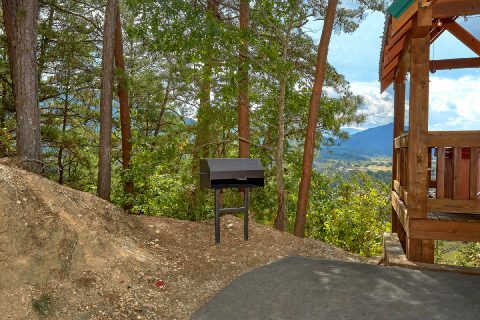 The open floor plan on the main level also features a modern kitchen with everything needed for cooking great meals with good company. 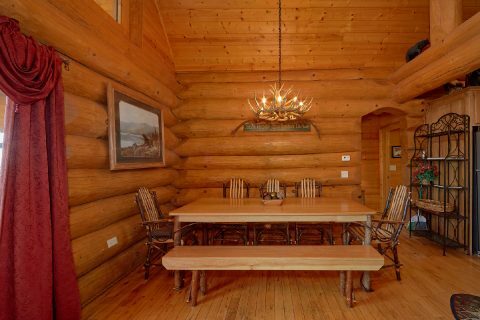 Gather around the hand-crafted, hickory-wood dining table that seats 8 comfortably. 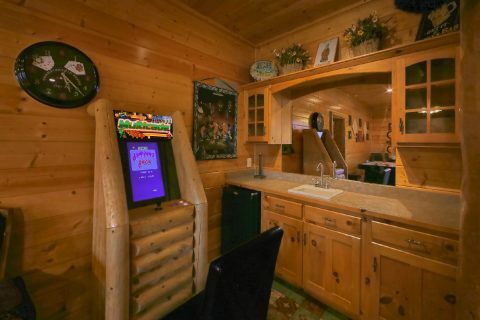 There's also a breakfast bar with 3 stools for enjoying a quick snack. 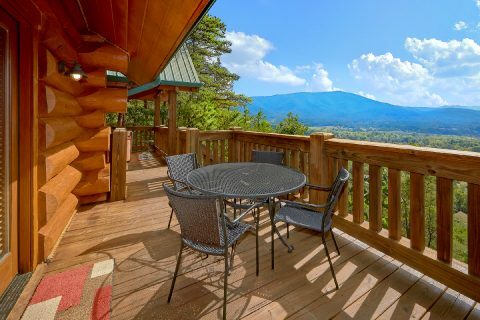 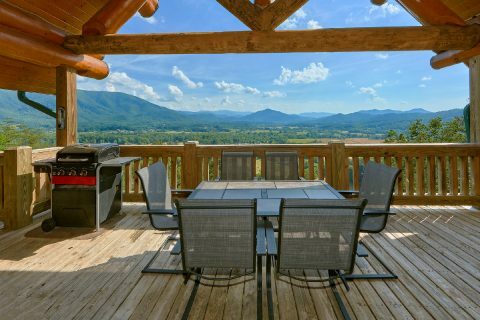 Out on the deck, your rental features a gourmet gas grill and patio furniture that are perfect for hosting a cookout in the fresh mountain air. 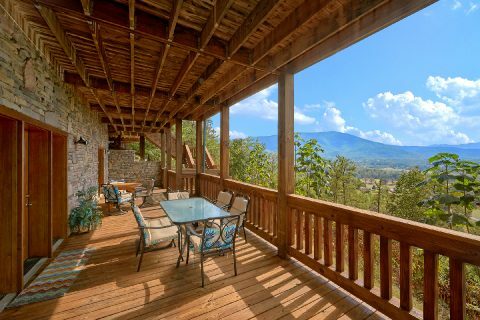 While you're outside, you can sit back in a rocking chair with the Smoky Mountains as your backdrop. 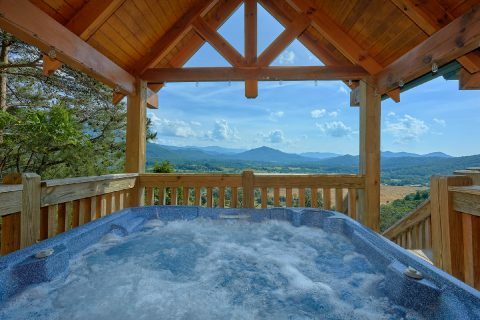 To unwind, head over to the deck's covered gazebo with a year-round, 5-person hot tub for a dip and to take in the cabin's beautiful natural settings. 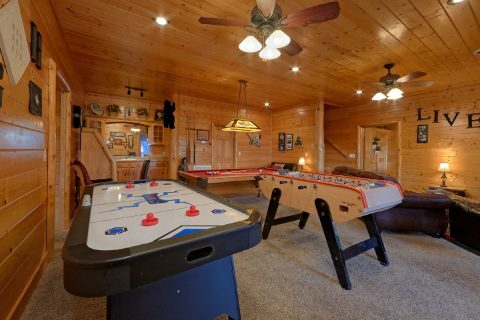 For in-cabin entertainment, you'll find a fantastic game room on the lower level of your rental complete with a pool table, air hockey, board games, card table, and a PlayStation 2. 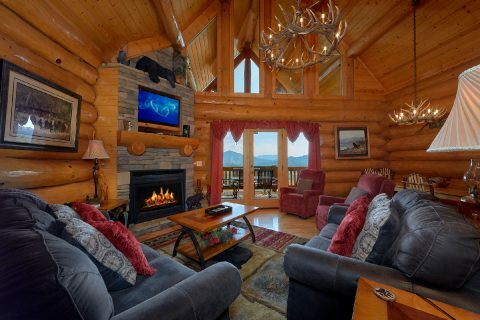 This comfortable space also features a 42" Flat-Screen HDTV, DVD player with a library of DVDs, and a sleeper sofa. 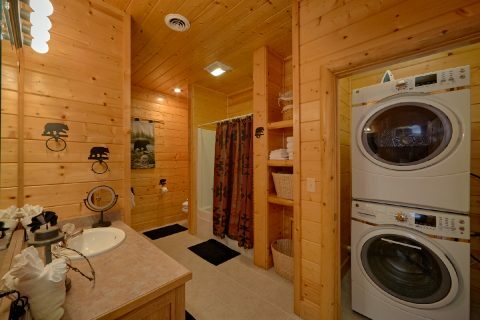 Additionally, there's a wet bar with a sink and mini-fridge for enjoying snacks and refreshing beverages. 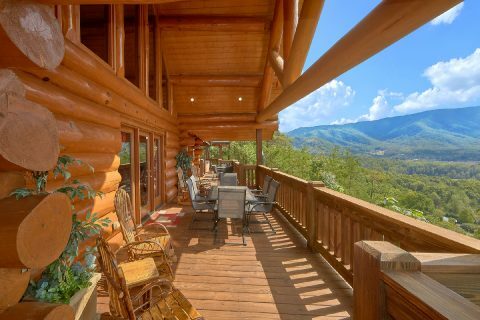 There's also a lower deck so you can enjoy the inspiring view and scenery. 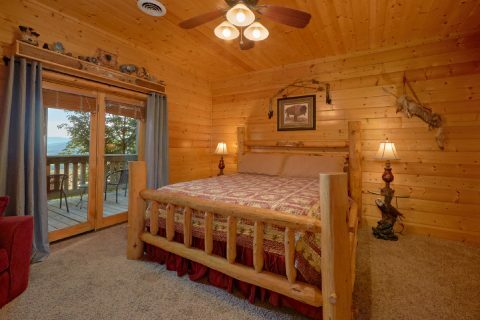 After a day of exploring Pigeon Forge, you can enjoy a short trip back to your rental in the mountains that's only 6 miles away from the Pigeon Forge Parkway. 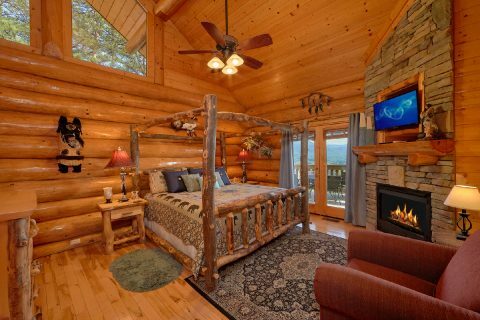 When it's time to get some much-needed rest, you'll love retiring to one of this cabin's 4-private bedrooms. 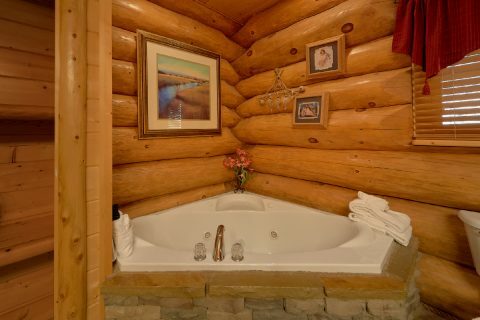 On the main level, there are 2 master suites that both feature king-size beds, 32" flat screen televisions, DVD players, stone fireplaces, private baths, and 2-person jacuzzis. 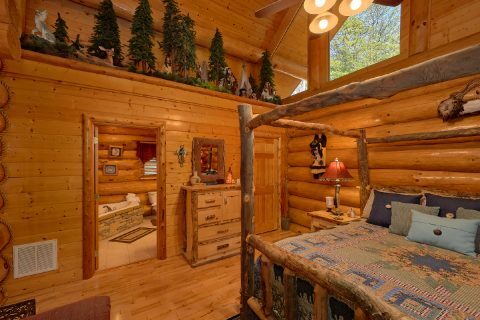 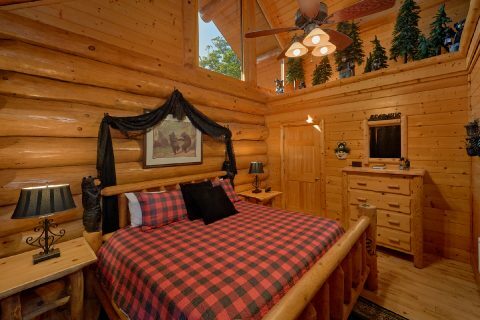 One bedroom provides a luxurious log canopy bed, while the other room boasts a sleep number bed for restful nights in your cabin getaway. 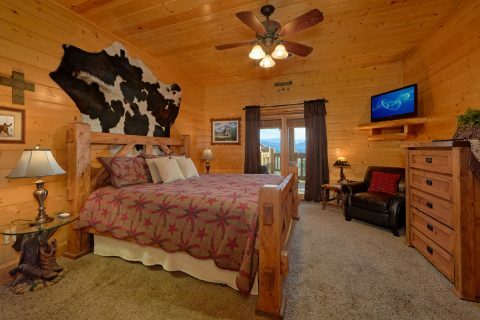 Downstairs, you'll find two more king-size bedrooms each with 32" flat-screen televisions and DVD players. 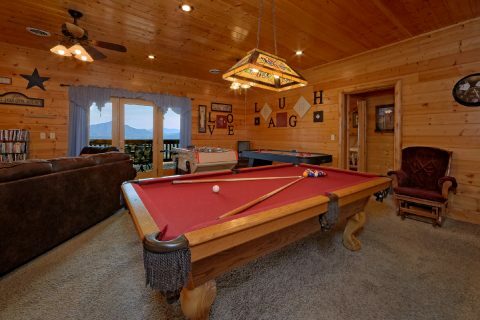 This rental also provides a sleeper sofa for extra guests in the game room. 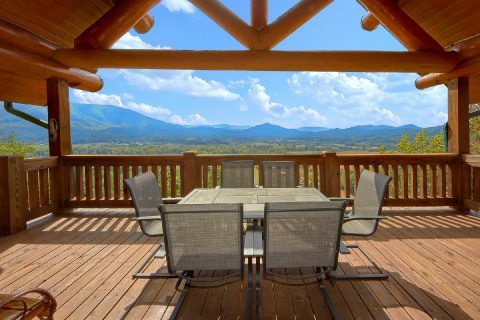 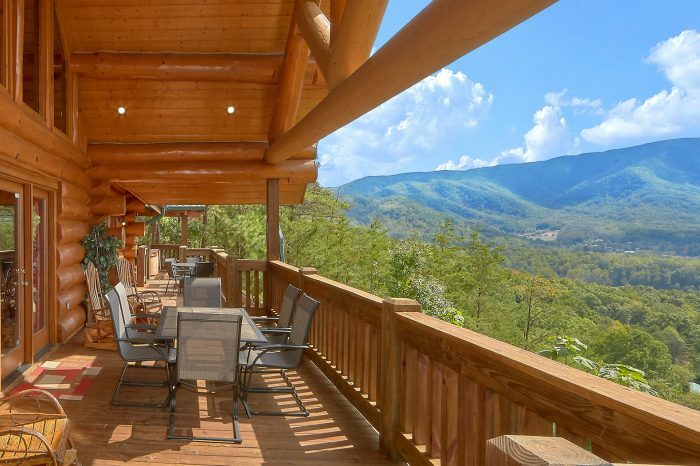 Not only does this rental offer premium mountain views, but also guests can easily explore the Great Smoky Mountains for themselves. 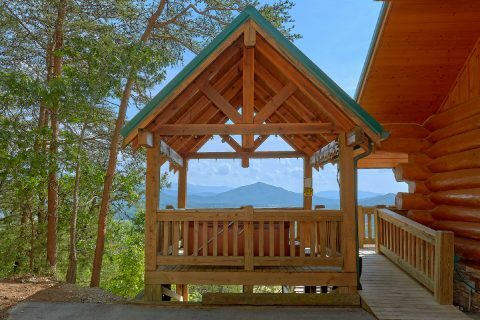 By driving through beautiful Wears Valley to the Metcalf Bottoms national park entrance, vacationers can find beautiful hiking trails and waterfalls in the Cades Cove, Tremont, and Elkmont regions of the park. 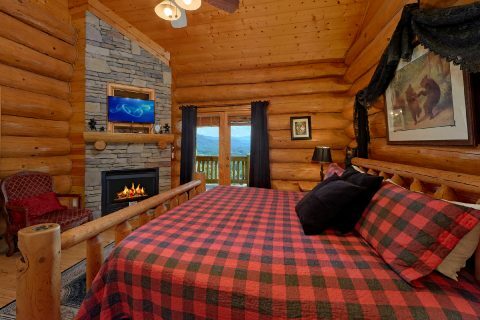 Don't forget to book your premium mountain lodge with Cabins USA to earn a special discount on your stay! 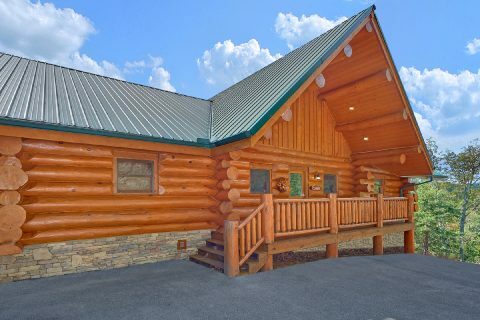 Save 15% when you reserve your 4-bedroom cabin online or by calling our office. 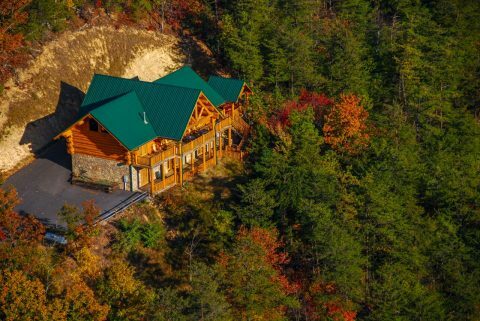 Start planning an unforgettable trip with your friends and family in beautiful Wears Valley, TN!